Now that our ambitious New Year&apos;s resolutions have safely faded away, it&apos;s time to indulge in one of America&apos;s favorite pastimes, the all-you-can-eat deal. From bottomless brunches to overflowing buffet tables, Korean BBQ to unlimited Dodger Dogs, L.A. offers plenty of extravagant opportunities to gorge yourself as though you were a professional competitive eater. Here are our favorite places around town where you can freely feast—and in some cases drink—without worrying about a whopping bill or disapproving stares. Roy Choi&apos;s former-IHOP-turned-Hawaiian-luau restaurant taps into the buildings roots with an all-you-can-eat pancake deal at brunch that&apos;s tough to beat. 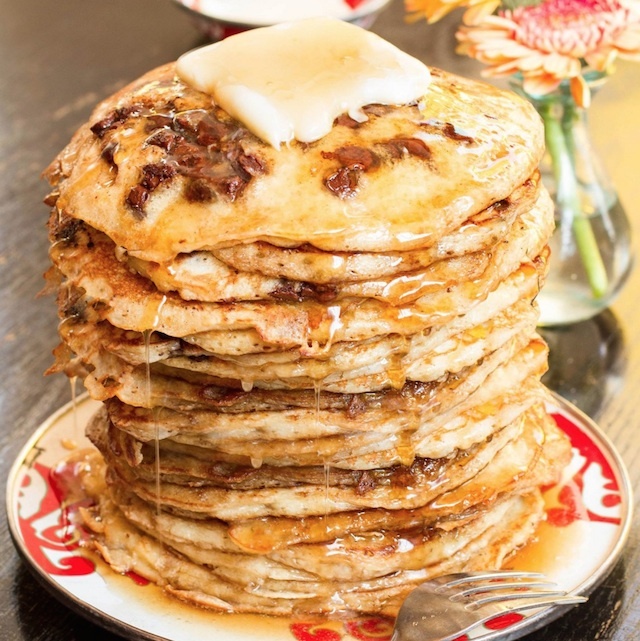 For $15 per person, you get two pancakes at a time and can choose from some great aloha-inspired toppings like lilikoi butter made with passionfruit, banana and macadamia nut, and the addictive mochiko fried chicken. For $16 more, you can mix-and-match bottomless brunch cocktails, including spicy micheladas, mimosas, bloody Marys and Primo Hawaiian lager. The brunch deal is available Saturday and Sunday from 10 a.m. to 3 p.m.
A-Frame is located at 12565 W Washington Boulevard, Culver City, (310) 398-7700. There are, thankfully, an abundance of great AYCE Korean BBQ options across L.A., but some just stand out from the crowd. And while other Koreatown stalwarts like Hae Jang Chon and Road to Seoul are great options, the two-story meat grilling emporium of Oo-Kook Korean BBQ stands out as a favorite (and an often less crowded one). The quality and selection of meats and banchan available to compliment your feast are excellent, though one of the big selling points is their black Angus steak that arrives as a large slab of meat as opposed to thinly-sliced options you typically get. That said, we&apos;re also fans of the marinated Kobe slices and the miso pork. At $28.99 per person, it&apos;s a little pricier than many AYCE options around town, but you&apos;re paying for the quality and extensive options. And, if you want to save a few bucks, go for lunch from 11 a.m. to 3 p.m., Monday through Friday, you can feast for $23.99. 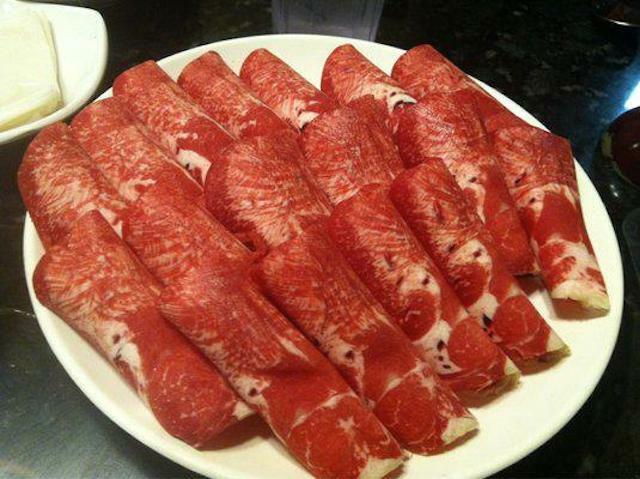 Oo-Kook Korean BBQ is located at 3385 W 8th Street, Koreatown, (213) 385-5665. Border Grill is located at 445 S. Figueroa Street, downtown L.A., (213) 486-5171, and 1445 4th Street, Santa Monica, (310) 451-1655. Border Brunch is available on weekends until 3 p.m. If you&apos;re someone who ends up spending more on food at Dodger games than your tickets, the All-you-can-eat Right Field Pavilion works out to be a pretty good, belly-busting deal. Tickets prices vary, but usually start out around $33/seat and include unlimited Dodger Dogs, nachos, popcorn, peanuts, soda and water. Sorry, you&apos;ll have to buy your beer separately. We&apos;re obviously not talking about a gourmet feast here, but hey, unlimited Dodger Dogs! Keep in mind, the lines can get pretty long, so you&apos;ll want to stock up. And be sure to be wearing your stretchy pants for the 7th inning stretch, when the cookies show up. Dodger Stadium is located at 1000 Elysian Park Avenue, Los Angeles, (323) 224-1507. While most all-you-can-eat buffets at hotels tend not to be anything to write home about, the vastly superior and extensive offers at Cafe Sierra inside Hilton Universal City is a worthwhile exception, even for locals. Saturday mornings offers respectable options, but the Sunday jazz brunch is just plain decadent. For $50 per person, you can sip champagne while continually stuffing your face from a well-stocked raw bar with King crab legs and oysters, a sushi and caviar station, waffles, tacos, paella, carving stations with prime rib and lamb, pork buns and har gow, a chocolate fountain, made-to-order crepes, cotton candy, and well, you get the idea. 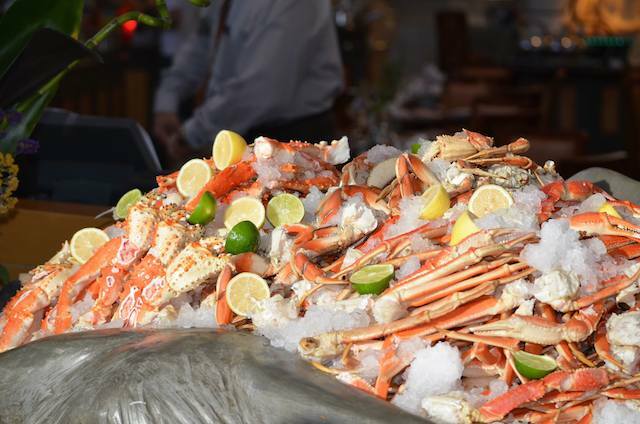 And if that&apos;s not enough, in the evenings from Friday to Sunday, their seafood and prime rib buffet offers most of those quality options and then some for $54 per person. You may just have to reserve a room should you find yourself incapacitated from all of the food. Cafe Sierra is located at 555 Universal Hollywood Drive, Universal City, (818) 509-2030. Sushi is generally one of those meals that you really want to set quality over quantity, but this North Hollywood joint thankfully delivers strong on both. For $22.95 during lunch (11:30 a.m. to 3 p.m.) and $27.95 at dinner (3 p.m. to 10 p.m.), you can test your endurance with three rounds of all-you-can-eat sushi for one hour. Unlike some other AYCE sushi outfits, here you won&apos;t find the sushi and rolls or pieces loaded up with rice that can quickly fill you up. They even offer some special "no rice" rolls to maximize your fish intake. But keep in mind when stacking up your last order, you&apos;ll be charged the regular menu price for any items leftover. 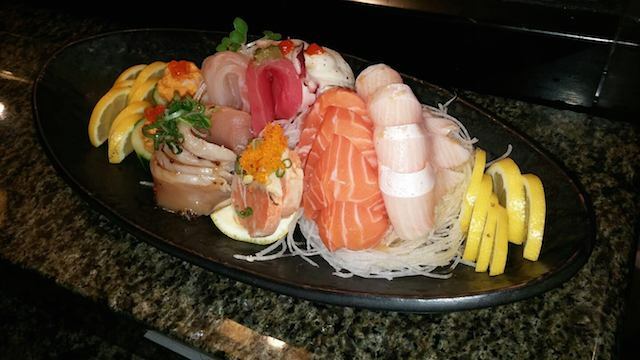 The Sushi By Jin is located at 6010 Laurel Canyon Boulevard, North Hollywood, (818) 985-6010. Head to this cozy wine bar with an ocean breeze on the last Sunday of the month for a killer "Beefsteak Sunday" special. 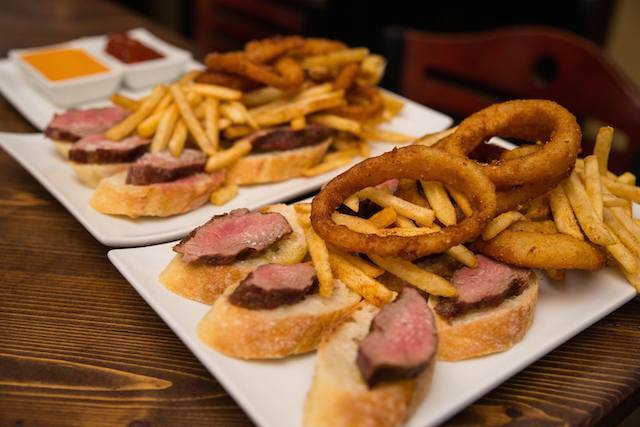 For $35 each, you can devour all the petite filet steak, fries and house onion rings you can handle, plus, you can take advantage of their open bar deal. The open bar includes bottomless house sangria, red wine, white wine, champagne and Bacaro Beer for 90 minutes. The open bar deal is available other days as well, but your whole party must participate (designated driver excluded). Both specials are also available at their Bacaro LA location near USC. Bacari PDR is located at 6805 Vista Del Mar Lane, Playa Del Rey, (310) 439-2100; Bacaro LA is located at 2308 S Union Avenue, University Park, (213) 748-7205. 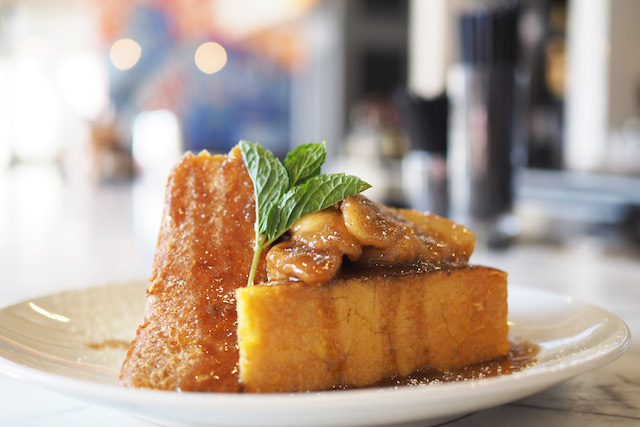 While there&apos;s only one all-you-can-eat option at The Independence in Santa Monica, their bottomless French toast ($17) is definitely a big draw during chef Craig Hopson&apos;s solid weekend brunch. The thick slices continually arrive covered with sautéed bananas, rum caramel, and walnuts, and are perfect for sharing (or then again, not). The Independence is located at 205 Broadway, Santa Monica, (310) 458-2500. While we sometimes pretend we&apos;re at an all-you-can-eat buffet when we hit up our favorite taco trucks late at night, if we&apos;re looking for the true bottomless option with the added bonus of seats, we look to La Paz. 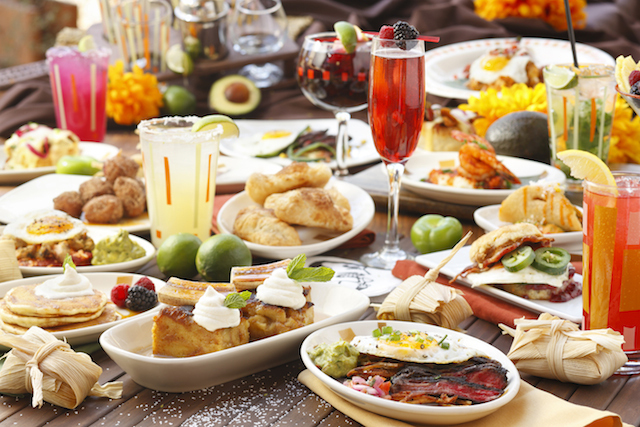 This decades-old Calabasas institution serves up a tremendous Mexican brunch buffet on Sundays, which features great options like carnitas, BBQ goat, enchiladas, menudo, ceviche and Yucatan specialties like cochinita pibil, in addition to brunch staples like an omelet station and prime rib. The $32 price tag for adults includes 3 margaritas or glasses of champagne per person, as well as tax and tip. Plus, there&apos;s the added bonus of mariachi bands playing throughout the morning. The brunch runs from 10 a.m. to 2 p.m., but we advise getting there early as the crowds can get crazy. If you&apos;re in the neighborhood, you also might want to check out their Friday lunch buffet for $10.99 or their free happy hour appetizer buffet with cheap deals on beers and margaritas. La Paz is located at 4505 Las Virgenes Road #101, Calabasas, (818) 880-8076. 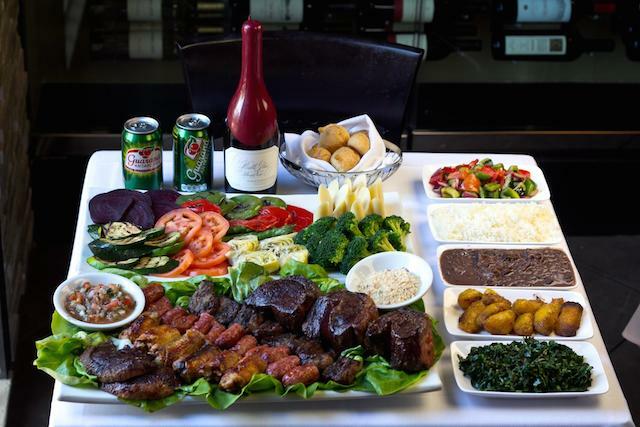 We&apos;re fans of the bountiful offerings at the iconic Fogo De Chão, but L.A.-based M Grill offers an excellent all-you-can-eat Brazilian churrascaria option for a bit less. For $29.99 at lunch and $53.99 at dinner, feast on an array of delicious grilled meats, including top sirloin, linguica and pork spare ribs. You&apos;ll also definitely want to sample the grilled pineapple and take advantage of the hot buffet with fried plantains and yucca and the quality salad bar with plenty of veggies and a variety of salads (for those who aren&apos;t into the meat fest, this can be an option on its own for $28.99). And while you&apos;ll be tempted to devour the bottomless Brazilian cheese bread, aka pão de queijo, be sure to save room for the rest of the quality cuts of meat. M Grill is located at 3832 Wilshire Boulevard #202, Koreatown, (213) 389-2770. 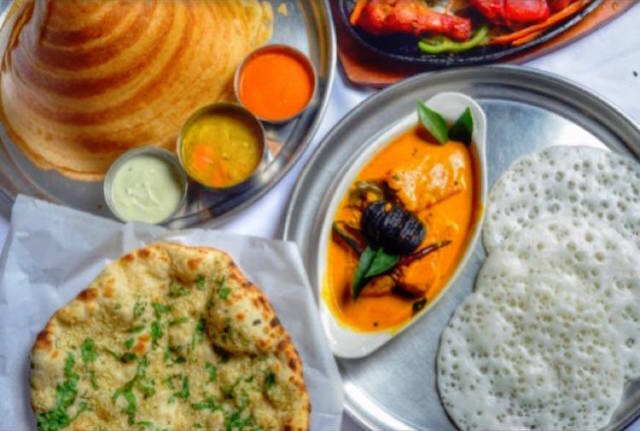 Mayura is located at 10406 Venice Boulevard, Culver City. (310) 559-9644. This SGV mainstay has been delighting hungry diners for decades with their extensive all-you-can-eat Lebanese buffet, available for both lunch and dinner. From slow-roasted lamb, shawarma and kebabs to creamy hummus, fluffy pilaf and falafel, this inexpensive buffet offers something for everyone—including vegetarians—and keeps you coming back for seconds (and thirds, and fourths). To hit up the lunch buffet during the week will only set you back $10.95, and on Monday through Thursday nights you can attack the dinner buffet for $12.95. Dinner on Friday and all day Saturday and Sunday will set you back a mere $15.95. Just be sure that you save room for the honey-drizzled baklava at the end of your feast. Wahib&apos;s Middle East Restaurant is located at 910 E Main St, Alhambra, (626) 281-1006.